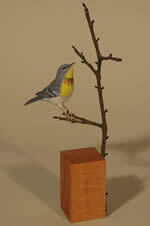 The Shakerag bird carving class is a beginning class in carving birds in American Basswood. The participants in the class will be carving a Solitary Sandpiper. The carvings of these birds will not be limited to the realistic wild form of the bird. I will encourage people to be expressive with the colors and patterns of paints even though the carved form will be based on a real bird. The class will emphasize the basic use of a knife and simple painting techniques compatible with a wood surface. The participants will learn how to sharpen a knife, carve feathers, set glass eyes and how to prepare a bird for painting. Steven Valleau has been Carver-in-Residence at the Wendell Gilley Museum in Maine since 1985. A keen birder since boyhood, Valleau earned a biology degree from the University of Maine at Orono and Indiana University. However, his true vocation was revealed by several art courses. Encouraged by art and ornithology professors, he became a professional bird carver. Sought after as both an artist and a teacher, Valleau has taught students of all ages and created carvings that range from miniature shorebirds to life-size great blue herons. His works are in many private and public collections. The façade of the Gilley Museum features a series of bas-reliefs depicting seven native bird species, which Valleau created for the 15th anniversary of the Museum. I have been carving birds for nearly fifty years. My interest in bird carving began when I was a child, first as an interest in birds, initially expressed in simply drawing and then carving and painting wooden birds. For decades I carved realistic birds, trying to capture the finest details in hopes of achieving some measure of realism. My interest now centers on how birds’ lives fit into our human world, what we feel about them. I was especially inspired by Anthony Doerr's use of birds, in his novel All the Light We Cannot See, as powerful representations of ineffable human qualities and natural forces. I haven't achieved that but I do like dressing them up in bright colors. Steven will supply all materials needed for the class. Students are welcome to bring their own knives, bird references, measuring tools and acrylic painting materials.